Las Vegas legend Wayne Newton is set to appear in the upcoming RPG Fallout: New Vegas as part of a stacked cast that also includes Matthew Perry, Michael Dorn, Danny Trejo and Kris Kristofferson. War never changes, so the saying goes, and apparently neither does Vegas. Not even a nuclear apocalypse could dim the city's lights and not even a post-nuclear alternate future could keep Wayne Newton, the man known as Mr. Las Vegas, from being there. 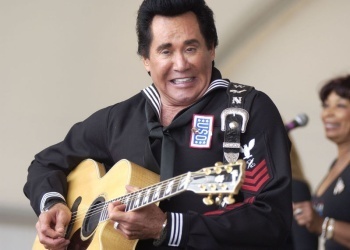 "Even in the post-apocalypse, there's still Wayne Newton," said Executive Producer Jason Bergman. "I think he got a kick out of that." Newton will appear as the voice of a radio DJ that was recorded hundreds of years earlier, presumably before the Great War, that continues to broadcast to the current day. Bergman said the role was created specifically for Newton's first-ever appearance in a videogame. "He is Las Vegas," Bergman said. "He really brings that extra touch of Vegas class to the game... And whether he's reading news stories about super mutants or introducing a Dean Martin song, his personality comes through." In order to ensure that true Vegas vibe, Newton said that when he read his lines, he'd "do them just a little bit different, each one, until we hit on what it was the guys wanted... where it is Wayne Newton, but it's not Wayne Newton, you know?" Joining Newton in the bright lights of the desert will be Matthew Perry, Zach Levi, Kris Kristofferson, Michael Dorn, Felicia Day, Danny Trejo, Rene Auberjonois, John Doman, William Sadler and of course Ron Perlman, who will once again take up the mantle of narrator. Yes, you can color me impressed. Fallout: New Vegas is scheduled to launch on October 19 for the PC, Xbox 360 and PlayStation 3.